Let’s get this out of the way: here’s yet another manga where I’m going to suggest avoiding reading the publisher provided summary if at all possible. It’s worse than normal here, as they literally spoil the last page of the first volume (as well as other major surprises). Another publication related annoyance is that there is no distinction being made between hardcover “volume 1” and kindle “volume 1,” where the former is actually an omnibus of volumes 1 and 2 and thus twice the length of the kindle edition. Yes, Amazon is largely at fault for combining the editions on the sale page, but the publisher does the same on their web page and creates confusion by not using different covers and titles for the two different versions. I am reviewing the kindle edition here, so the actual first volume (chapters 1-6) and not “hardcover volume 1” (volumes 1 & 2 as originally published, chapters 1-12). 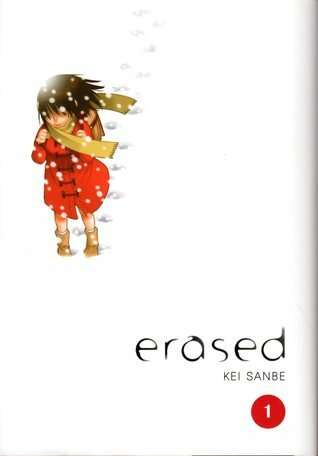 With all of that addressed, Erased is a fantastic manga off to a thoroughly gripping start. One volume in and there are already several intertwined, compelling mysteries to unravel. The main character has a difficult past hanging over his head and an inexplicable, uncontrollable power that are fantastic hooks to build Erased’s gradual, tense narrative. There’s already a lot to think about and unpack, which is great. The previously mentioned ending of chapter 6 provides a huge cliffhanger that presumably sets up the course of the story for the majority of the series. The mysteries and suspense surrounding Satoru’s story are captivating and I’m beyond intrigued to see where it all goes from here.